Bristol Motor Speedway first opened in 1961. Although it has relatively short straightaways for a track of its size (200 yards), it may be the world’s fastest half-mile race track. The reason the track is so fast is because of the speed that can be maintained through the 300 yard turns. The banking is currently variable and can be as steep as 30 degrees. For many years, the track advertised that the banking was 36 degrees. When the track was resurfaced in 2007, the new surface included variable banking from 26 to 30 degrees. More than one race team measured the banking prior to 2007 at around 26 degrees, so there has been some dispute as to the actual height for many years prior to the resurfacing. The track abandoned asphalt in favor of concrete in 1992. 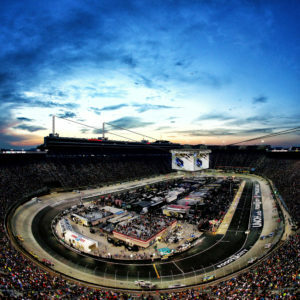 In 2000 and then again in 2001, clay was hauled in and Bristol Motor Speedway became a dirt track, hosting the World of Outlaws’ Channellock Challenge. This process involved laying down 18,900 cubic feet of sawdust to cover the paved surface, then laying 8,000 cubic feet of red clay on top of the sawdust. The banking was reduce from 36 degrees to about 23 degrees and the racing surface was widened by about 13 feet. The races were popular, but 14,000 truckloads of material was a lot of work, expensive, and it tore up the roads around the track. 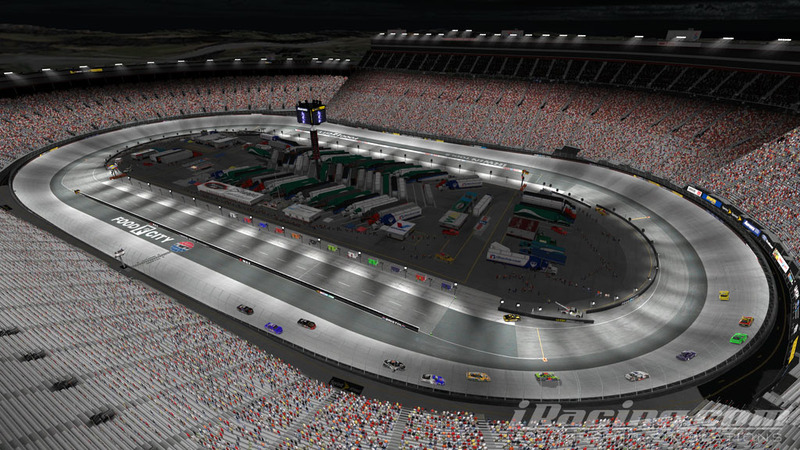 Bristol Motor Speedway is a .533 mile track located in Bristol, Tennessee. The track has a typical oval shape that is almost symmetrical. Turns one and two are just a little bit tighter but you really have to drive it a while to notice it. The turns feature progressive banking from 26 – 30° with 6-10° banking on the straights. The racing surface is good quality concrete and it’s about 3 lanes wide. This track really tests the capabilities of every type of short track car and pretty much every driver that races on it. All of the cars can run as fast as they can anywhere due to the incredibly high banking and the grip in the concrete surface. The abrasive concrete wears the tires quickly. In the faster cars, it’s pretty easy to build a setup that is fast for 5 or 10 laps. The trick is to build one that lasts for the long run. It’s pretty much a hold-on-tight-white-knuckle-ride around Bristol in any car, particularly the Super Late Model and the Tour Modified. Most people prefer a high line around Bristol. The banking is steeper up by the wall and they can make the car work better there. I start off running right on the bottom for a few laps. As my lap times begin to increase, I start moving up a little and trying different lines. I usually end up somewhere near the middle of the track or maybe just a little higher. I usually drive turns one and two just a little higher than turns three and four. Anybody who has ever driven around Bristol Motor Speedway very much can probably guess why: turns one and two are a little bit tighter than turns three and four. I’ve never really been able to get my car to work right up next to the wall, but some people can and they are usually faster than I am at Bristol. Tire management is critically important, so if you can get the car to work up high, it is easier on the tires. Try to keep a conservative yet fast pace. Get in a rhythm and keep at it. I don’t use any brakes on this track in any of the short track cars. As I come down toward the turn, I use my judgement and lift when I feel the need to lift. Don’t ask me about marks because I never use them. As I roll through the turn, I usually begin to roll back into throttle somewhere near the apex. How fast? It depends on the car. In a Street Stock I probably go straight to the floor until the tires get some wear, then I’m more conservative. In the more powerful cars, I roll into the throttle more slowly. As you exit, do whatever you have to do to keep the rear end of the car in line and hooked up. Any tire spin or loosey goosey here is going to be detrimental to your tires, and the only way to fix that is to slow down in the turns for two or three laps and cool them down. Race lost.